See here for my border crossing adventure! Private taxi, all the way, arranged through Hotel Sahara — 350 DH. I was told it would be shared, but I ended up being the only passenger. Driver has family on both sides of the border, so as long as he has one person going, it’s worth the trip for him. I’m certain there are cheaper ways to share cars, but I wasn’t able to find out where. I suspect there is a garage outside the town where you can find one. Visa bought at the border. €45 for 30 days. It is highly advisable to prepare yourself some fiches. These are little forms that contain all your essential passport and travel information, which can be given out at the numerous police and gendarme checkpoints as you travel throughout Mauritania. Make as many copies as you feel reasonable to carry (at least 20-30 should be enough). I used the template given here, but ultimately ended up making my own condensed version (as some of the info in it was not ever asked for, and I didn’t have a vehicle). Once I ran out of printed copies, I wrote some out by hand. In any case, they are helpful for moving things along, and might even save you from getting out of the car every 20m. I wrongly followed the advice of my recently-purchased Lonely Planet guidebook, and winded up at Camping Abba. It took my driver quite a while to find it, and it did seem like it was out in the middle of nowhere. But then again, maybe that’s how all of NBD is. Dbl room at Camping Abba was 3000 MRO. Room was crawling with cockroaches, mattress was old and dirty, no linens were provided…. but there was a hot shower! Still not recommended, though I can’t tell you if there’s anything much better to chose from. Most of the decent food in Mauritania is either Moroccan or Senegalese. Mauritanians make a couscous, which is a bit grainer than its northern counterpart, but is good as well, just not as easy to find on the streets. Moroccan place next door to Camping Abba served a basic and overpriced (but already prepared) Harira, and other dishes upon request. I arrived late and did not explore further. There was a chinese place on the other side, which is allegedly good, but more expensive than I was looking for. minibus to NKT with Prince’s — 6000MRO. Scheduled to leave at 8am & 4pm, but ended up leaving around 1pm when enough tickets were sold. Many agencies are running this route, so there is plenty to choose from, but no apparent variation in the schedule. The condition of the vehicles with Prince’s are not as nice as Salima Voyages, which charge the same price, but are much more comfortable, have AC, and are well organized to address the police checkpoints for you by making copies of your information. As mentioned in the note above, the guy running Camping Abba “suggested” that I stay at Auberge Awkar in Noukchott, which really meant that he took me to the bus himself, so that he could tell his friend which one I was on. Thus, I was greeted by name upon arrival and was taken there, without much choice in the matter. I can’t say there was much charm to NKT. I visited the fish market, which was pretty great, but not necesssary if you’ve seen others on the Mauri or Senegalese coasts. Auberge Akwar has a dorm room, with what looked to be at least 15 beds! Side-by-side, like sardines — 3000/night. Manager gave me a private single room for the same price, but I still felt that the staff here were manipulative and shady. Decent wifi, though. Next time in NKT, I moved to the Auberge Sahara, which is right around the corner, but has a much better atmosphere. More traveller-oriented, relaxed and comfortable. 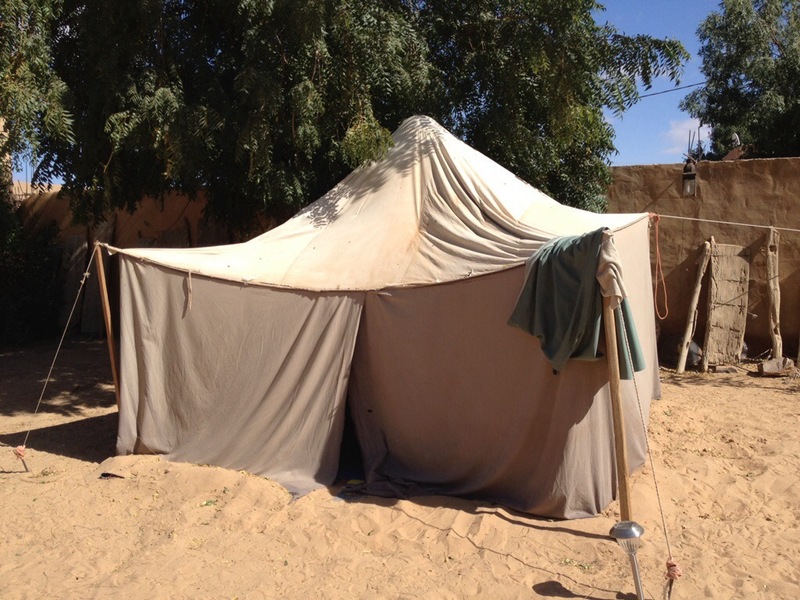 I took a Saharan tent up on the roof for 1500/night. Sandy and the mattress left plenty to be desired, but had a net and was nice and cool at night. 2000 for a bit more structure but dorm-style, 6-8 beds. Wifi is also good here, and both Auberges are in the same neighborhood as the Senegalese Embassy. Auberge Akwar and Sahara are both in the Las Palmas neighborhood, which is quite a ways out of the city centre. At the time, a taxi to town was 200-300, depending on the driver. If fuel prices continue to increase, so will the price of a taxi. There are many inofficial taxis in Mauri. Guys will just drive around looking to pick people up. Gare Routiere is far from the city centre. Got a ride with someone, but I think it should normally cost around 1000.
minibus to Atar — 4000 with Salima Voyages. Many agencies to choose from, but all left at the same time, 4pm. Salima has good drivers, comfortable vehicles, and AC. Thanks to the shady characters at the Auberge Akwar, I was being pressured to stay at Camping Inimi in Atar. 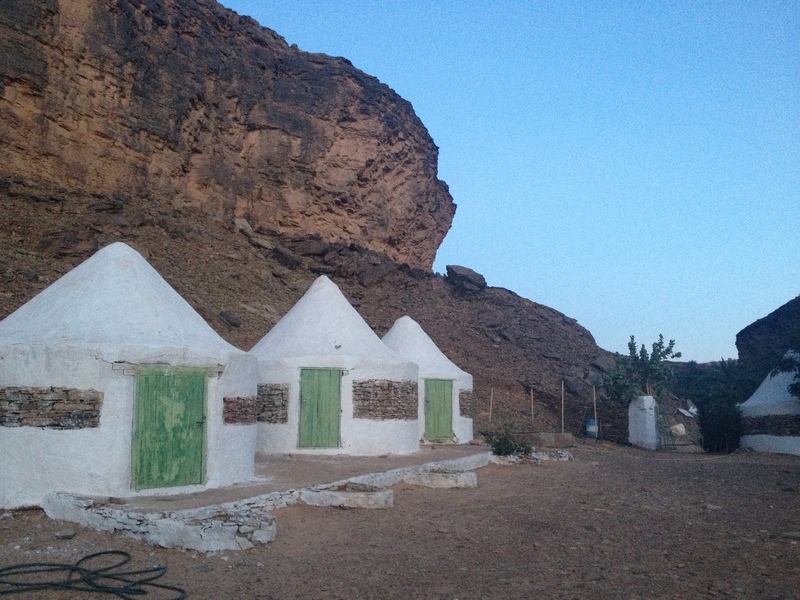 I have heard good things about the place, but with a bad taste in my mouth, and the desire to regain my agency to make my own decisions, I was determined to stay at the Auberge Bab Sahara (I paid 3000/night for a two-person tent, but I believe the actual price is meant to be 6000 for the entire thing). Luckily, I narrowly escaped the guy from Inimi who was so kindly awaiting my arrival, and successfully checked in to the Bab Sahara, which was heavenly. Very calm and clean and lovely. But I was singled out while eating breakfast in town the next day, by the guys at Inimi, who I had never met. There are just so few tourists coming through, that the new white girl had to be the one they were looking for. I felt tons of pressure here and was uncomfortable the majority of the time. The guesthouse in Tirjit. I had the entire place to myself. Private car from Atar to Tirjit was 5000, but I waited until the driver was going home around 5pm, who then took a few people for 1000 only. Otherwise, absolutely no shared transportation. It says in the guidebook that you can take a car travelling between Atar and NKT, and get off at the junction, but it’s still a significant distance from there, and not so many cars passing by. I stayed two nights without seeing another tourist. 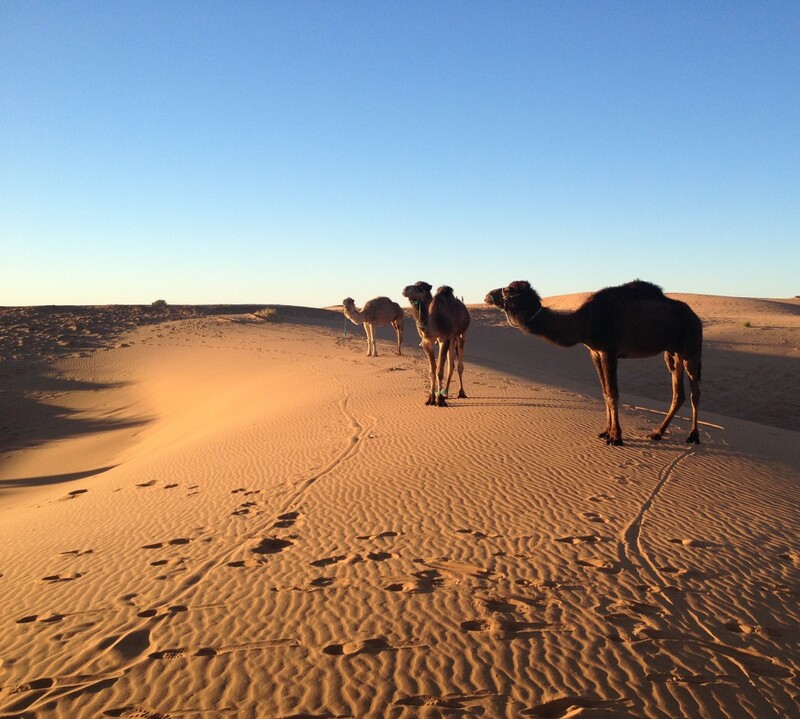 The guy running the auberge made me really delicious mauritanian meals, and took me for a walk up the hills surrounding the oasis. The views are pretty spectacular, with rock faces sitting next to sand dunes and the sudden burst of lush greenery of the oasis. I never got the price breakdown, but all in total with 4 meals, the tour, and two nights was 14000 (a bit pricey, I felt, but not so much that I was going to complain). caught a ride with the same driver in the morning. I paid 1000 again, even though he wanted me to pay more. I objected, as I knew he was going anyway! 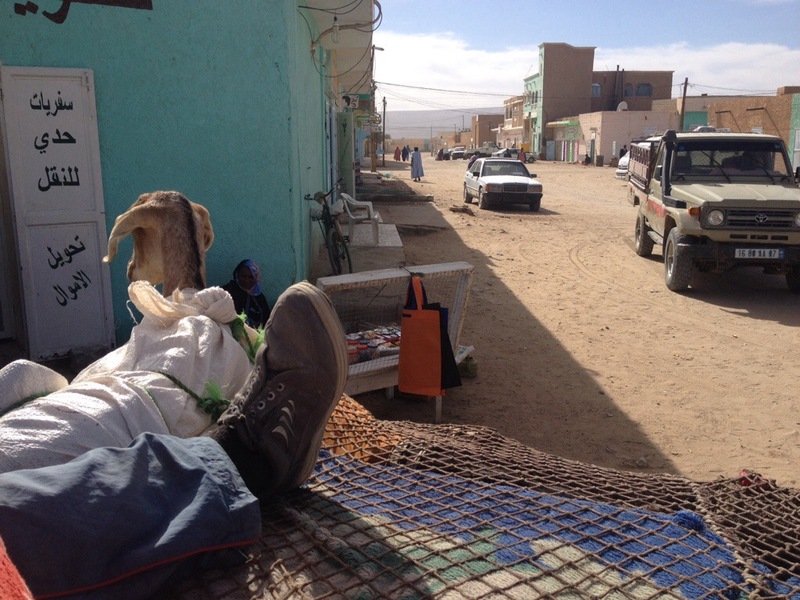 From Atar, I joined a 4×4 truck in the morning which was going to Choum — 2500 to ride in the bed, on top of everybody’s stuff. 3000 to get a spot inside, but in the back was way more fun anyway, though the goat would beg to differ. I went to Choum to take the train to Zouerat and back. I did this to experience the train both day and night, empty and full. I vote for empty, but there’s less of the cool-factor when you don’t climb off covered in black soot. back to) the train in the middle of the night, and he even offered me some money in case I needed anything on my way! I ran into some other travellers who had taken the train as well, and they were just sleeping in some communal room in Choum, waiting for the 4×4 trucks to take us back to Atar. So I guess that’s where you stay when you don’t get taken in by a generous Mauritanian family. There didn’t appear to be much in Zouerat. I only stayed for a few hours while the train loaded up, then headed back to Choum/Atar. The border at Rosso is notorious for hassle, bribes, and corruption. But I was whisked through by some friends I made on the way. A bit more on this can be found here. 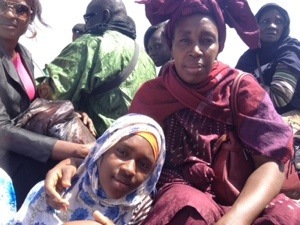 The mother and daughter of the lovely family who helped me cross the border into Senegal. On the pirogue (small fishing boat) to bring us across the river into Rosso. You pay nothing to cross the border!! The stamp is free. 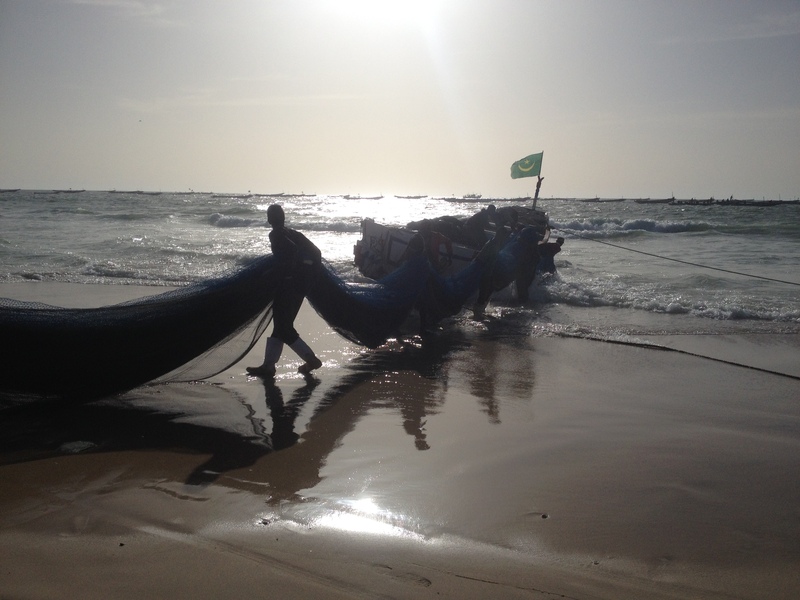 See this page for the journey onward through Senegal.